Can't afford Visio? 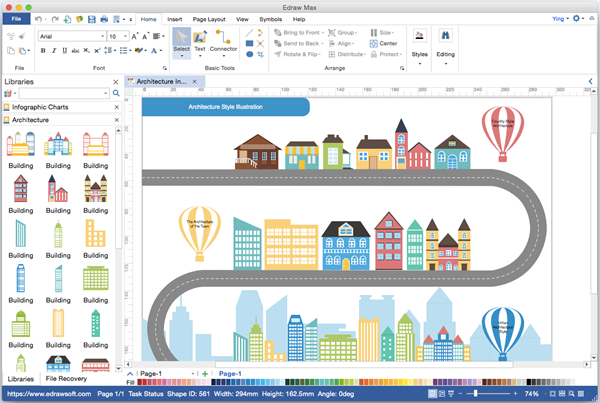 Edraw is a cheap and powerful Visio alternative for making infographics, presentation, diagrams and more on Mac system. Anyone can handle it easily. Try it for free. Edraw - Make Innovative Infographics. Achieve Awesome Content. As we all know, Visio is not good at making infographics. However, as an effective Visio alternative, Edraw is also capaple in drawing infographics. You can not only get thousands of ready-made vector design elements from the software, but also draft your own graphics with our drawing tool set. Now the software is available on both Mac OS X and Windows. It offers tons of resources at your fingertip to bring your ideas to life. Edraw is a vector based diagramming software containing similar features with Visio but is much more affordable than Visio. It offers thousands of free images and dozens of templates in various style. With this Visio like tool, users can develop professional infographics in a way faster than you think. You can use the program to create infographic, reports, product demos, presentations, courseware, web banners and so on. Then you can export it as image or PDF. Upload it to Cloud or publish it online to access from anywhere. Of course, as a desktop program for infographics, it also supports to present offline in PowerPoint. Massive diagram types supported. Ready for more than 200 diagrams, more powerful than Visio. Extremely simple with drag-and-drop based interface. Includes infographics symbols for business, transportation, education, environment, tourism, medical, music, technology, food, etc. Contains libraries of basic drawing elements, such as the basic drawing shapes, common shapes and icons. Create your own infographics quickly upon existing templates provided by the software. Lifelong service with a much cheaper price. Extensive built-in themes available to choose; easy to make visually pleasing diagram. Capable in printing or sharing. Support export for PDF, Html, Word, Visio, PNG, JPG, PPT, EPS, and many other formats. Provides the freedom to add and edit anything. Be able to draft any shape with Pen or Pencil tools. To create stunning infographics is not a difficult job any more. Just follow the simple steps below. Creating a simple infographic may only require less than 10 minutes. Start Edraw, choose a template to open an infographics drawing page and the related libraries. Browse the infographics symbol libraries and add titles, basic shapes, and texts to form the visual frame. Draw custom graphics with Pen or Pencil tools. Style the shapes as you like. Insert data, text, and customize. When the infographic is done, export the file to a desired format and save. As a full-featured Visio alternative, the software is also capable for flowchart, mind map, floor plan, fishbone diagram, timeline, network diagram, and so on. Discover why Edraw is an excellent program to create infographics. Try Mac Infographics Software FREE.